I’m entering my last week with my lovely Advanced group, the first class at this level I’ve taught for quite some time, and the whole experience has given me plenty to reflect on. One thing that’s become clearer in my mind is the fact that you really cannot progress that far beyond a certain level without a fairly broad range of interests, plenty of awareness of current affairs, topics that are generally deemed newsworthy and a desire to learn more not only about the language, but about the world itself. If all you’re interested in is shopping and going sightseeing, say, you can pretty much do all you’ll ever need to do in those departments by the end of Intermediate; certainly by the end of Upper-Intermediate. To properly be Advanced and to take on board the kind of language you’re likely to encounter in the Cambridge Advanced exam, you need not only to delve deeper into the lexis of topics you’ve already studied but to also delve into a wider range of topics – the law, the environment, natural disasters, hair and beauty, ethics, politics, economics, globalisation, and so on. Within each topic, there’ll be high-end language more commonly found in the written language, particularly in journalism and academia, as well as lower-end language more common in speech around each subject that’s well worth focusing on. During a recent tutorial, one of my Chinese students from this group mentioned how horizon-broadening she’d found the course. She mentioned that she hadn’t really had any grounding in areas like politics and even after having had them explained, still struggled to really grasp concepts such as HOLDING A REFERENDUM and FORMING A COALITION, for obvious reasons. She’d then gone home, Googled them, read up on them on Wikipedia and had lengthy conversations with her dad about these ideas and how they compared with the system back home. Now, if that’s not education in its fullest sense then I don’t know what is. A Work in groups. How much do you know about the recent historical milestones below? Discuss what you think happened– and what the causes and results were. Frequently, with these kinds of activities, I’m depressed and kind of appalled by how little world knowledge many of my students have – and remember, I’m mainly teaching young people who either are already graduates in their own countries or who want to do their degrees here in the UK – and wonder what they learn in subjects like History and Geography at school, but what really surprises – and depresses – me is the frequency with which conspiracy theories emerge. Over the years, I’ve lost count of the number of times I’ve had students from the Arab world tell me Mossad or the CIA was behind the 9/11 bombings, or students from a wide range of countries tell me that the moon landings never happened or that Princess Di was covertly taken out by the royal family and so on. I’ve almost come to expect to hear these ramblings in certain situations – and suspect many, many other teachers must also have been on the receiving end of them. In this particular instance, I was slightly taken aback because the student rolling out the theories wasn’t one I would have suspected – a young German guy, a Business Management graduate, who, having discussed the basic factual details of the collapse of the Twin Towers as a result of airplanes being flown into them, launched into the theory (laid out by Michael Moore in his fairly tedious Fahrenheit 911 doc) that it was all somehow an inside job and that it’d been arranged to create a pretext for the Iraq war. In retrospect, I could’ve seen this coming, as earlier we’d done a vocabulary exercise focusing on language that may prove useful when talking about key historical events, and including items like CALL A TRUCE, CLAIM / GAIN INDEPENDENCE, ISSUE A FORMAL APOLOGY, CARRY OUT A SERIES OF BOMBING, BE ASSASSINATED and so on. One of the practice questions was CAN YOU THINK OF ANY HIGH-PROFILE WHO HAVE BEEN ASSASSINATED? DO YOU KNOW WHY? During the speaking around this question, there’d been considerable debate from several students about the JFK murders and what the real story. I’d dealt with this basically by reformulating what I heard and ending up with a few gapped sentences up on the board, which I then elicited the missing words for. Here’s what I ended up with (I’ve italicised the words I’d initially gapped). After the revolution, the old dictator tried to flee the country, but was caught and executed. According to the official version, JFK was assassinated by a lone gunman, but there are lots of conspiracy theories around the killing. He was gunned down outside his house and died instantly. So as I say, in retrospect, perhaps it was no surprise that we would end up heading deeper into conspiracy theory territory. Two main thoughts emerged from this for me: why are these preposterous ideas still so rife . . . and what’s the best way for us as teachers and educators to deal with them when they crop up in our classes? And it’s this I’d like to move on to explore from hereon in. The very fact that conspiracy theories have become such common currency is slightly chilling. We have a large chunk of potential new graduates who not only are ignorant about official history, but who take pride in claiming the cachet of cool that attaches itself to a proud belief in conspiracy theories. I have students who KNOW that the moon landing never happened and that the film footage was faked, and yet they don’t actually know WHEN the supposed faked footage was from, or who the stars of the particular epic were! Forget the facts and feed the theories seems to be the modus operandi. How this then tallies with having to go on and engage in hard research, the evaluation of factual and historical data and so on is beyond me – and I’m glad I’m not the person who has to unpick the mess that must on occasion inevitably be created as a result. I think much of the growth of conspiracy theories is a direct result of the erosion of faith in governments and official versions of the truth, and I think it’s no coincidence that these beliefs are strongest and most common among students who come from countries where the state media is regarded with deep suspicion. Because governments lie and deny (and I’m certainly not excluding my own here, incidentally! ), it leaves room for questions and doubt – and in those shadows cranks flourish. However, to return to one of my favourite quotes, what then seems to happen is that rather than losing all faith and believing in nothing, many people instead end up believing in almost anything! In addition to this, there’s a global fear and distrust of the CIA and their operations, a fear stoked by the teenage angst movies of Michael Moore and the parallel knee-jerk self-hating literature of the likes of Noam Chomsky and John Pilger. Being clued-up on conspiracy theories becomes part of the cool kids’ club uniform, along with Che Guevara tees and Bob Marley CDs. Knowing information that other people don’t is a kind of socially motivated desire. We know something, everyone pays attention to us, interacts with us, seeks to find out the “secret”. It is the same kind of logic by which gossip becomes a currency in offices and institutions, a way for its possessors to boost their social status. Who they tell, who they confide in, who gets to be part of the “in” and who is “out” divides the group but solidifies allies. I think there are several other reasons why people so proudly parade their paranoias, though. Instability makes most people uncomfortable; we prefer to believe that we are living in a predictable, safe world – and conspiracy theories offer accounts of big scary events that make them feel safer and more predictable. In addition to this, we seem to be evolutionarily conditioned to connect dots that are not connected. In the same way that two animals hearing a rustling in some nearby bushes may well join the dots and conclude that a predator is close by – and therefore most likely live long enough to then teach this behavior to its offspring, so conspiracy becomes part of our psychological survival kit for trying times. One final reason why the Muslim world in particular, I think, clings so keenly to conspiracy came to me during a recent cab ride back from Heathrow airport, where I had a Somali cab driver. he was a lovely guy and had been living in the UK for over twenty years. We talked for a long time about the situation back home now compared to when he’d left and the fortunes of Al-Shabaab, the radical Islamist group that still controls part of the country. I was struck when my cabbie claimed that Al-Shabaab were “not Muslims”, as it seemed to me to be at the very heart of what they were. After further questioning, it turned out that what he meant was that the way they acted and carried out their business was so far beyond his own – and I suspect beyond many many many normal decent peaceful Muslims’ – interpretation of Islam that he couldn’t bring himself to recognise these people are fellow believers. Their tendency towards violence placed them, in his mind, outside of the Ummah. Once you cease to believe that people carrying out horrendous acts in the name of a religion you yourself feel as part of your every atom are actually what they claim to be, it’s only a short step to believing that they could well be controlled by outside agents. So where does all of this leave us as teachers? In a bit of a moral quandary would be my immediate reaction. Shouldn’t we be challenging this lunacy and pointing out its many flaws? Well, I’m not so sure. In a very fundamental sense, the whole point of conspiracy theories is that they can’t be disproved. Any evidence countering them can simply be taken as yet more proof of the lengths to which those REALLY behind things will go. Just as Creation Theory now claims that dinosaur skeletons don’t actually prove the world is more than 6000 years old, but rather that God has a sense of humour and placed them there to test our faith, so too the fact that Bin Laden and other al-Qaeda operatives openly boast and gloat of their killings can be interpreted as proof of the ingenuity the CIA / the Elders of Zion – and of their cunning use of film and technology. Logical argument is an impossibility in these situations. On a more morally complex level, though, there’s also the fact that these discussions throw our OWN faith back at us. How can we tell the difference between information and disinformation? Why are we so sure that Neil Armstrong really did land on the moon? Or that Princess Diana died because of a tipsy chauffeur who wobbled whilst trying to shake off the paparazzi? On a very fundamental level, for most of these, acceptance of these truths is in itself an act of faith and very very few of us know or care enough to argue against the obsessives who resist official reality. There are lots / l…….. / m……….. of conspiracy theories about 9-11. > Yes, but down that road lies m………….. .
And then elicited loads, millions and madness . . . before moving swiftly on! Given that last time I tried to do this, it seemed to take me an entire evening to write – and probably took you even longer to actually read through – I’ve decided that maybe the best way forward with these sections of the blog is to feature little windows onto classes that I’ve done; allow you, as it were, to spy on a selected slice of one of my three-hour classes. This lesson was another one with my main group this term, an Advanced class that I teach on Monday and Wednesday mornings from 09.15-12.30. The class runs five mornings a week and they have three different teachers. It’s only a hort eight-week term this time around, so we only have two more weeks together. The nationality breakdown is seven Chinese students, a Moroccan, an Iraqi, an Italian, a Taiwanese, a German, an Austrian (born in Romania), a Japanese and a Colombian. Here they all are (apart from two of them, who were absent today!). It’s a General English class and quite a strong group. We’re using OUTCOMES Advanced, and the part I’m going to detail below too maybe an hour all in all. We’re nearing the end of a unit called SCIENCE AND RESEARCH and are onto the last double-page spread, which is based around a listening. The main goals of this section were (a) to give students the opportunity to voice the ideas and opinions about the way scientists are perceived and portrayed in society (b) to explore and discuss what a range of different jobs within the field of science involve and (c) to give students practice in both extensive and intensive listening. My hunch was that the topic would interest students for a variety of reasons:I knew a few of the group had science backgrounds, having done either degrees or Master degrees in related areas, and this in itself would generate interest value; I also suspected that other students might at least know people who worked in related fields or else aspire to work in them themselves in future; on top of that, everyone would be able to discuss the stereotype of scientists and would be able to contribute some ideas to what different jobs might involve. Above and beyond that, though, there’s the simple fact that I knew the lessons would bring up plenty of new useful high frequency language and that, if handled in a certain way, the language itself would be of interest to the students in and of itself. 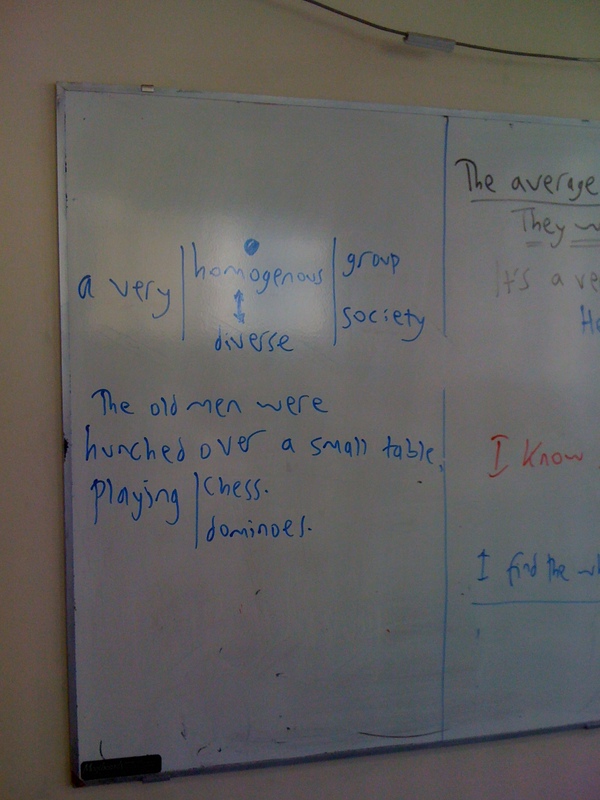 In a sense, this way of looking at what happens in a class reduces the importance of topic per se, as it assumes that whatever the topic, and to whatever degree students want or are able to discuss the topic itself, there’ll also be language coming up both from the material and from what the students themselves try to say that will be worth spending time and exploring, and that the interaction that occurs during these explorations is motivating and interesting in itself. So anyway . . . I started by saying that we were going to be talking about the way scientists were seen and portrayed in society – and the degree to which this encouraged – or discouraged – young people to enter the field. I told them they were going to read a short text about the strereotype of scientists in the UK and that it may well be different in their country. They should first just read and check they understand the text – and then they’d talk about it. Students read the text, shown below and I monitored. A fair few students asked about several problematic bits of vocabulary – particularly homogenous, geeky, hunched, muttering and scribbling. With geeky, I simply referred them to the Native Speaker note in the book below the text, whilst with the other words I glossed them briefly – a homogenous bunch is a group of very similar people . . . if you’re hunched, you’re sitting like this (and I then mimed hunching, with shoulders hunched up) , muttering is like quietly talking to yourself, maybe in a slightly mad way and scribbling is writing things down very quickly and maybe a bit carelessly, like this (more miming). I also used the students’ reading time to get a few whole sentence parallel examples of these new words up on the board to come back to later on. Anyway, here’s the text and the Native Speaker note that follows it. A Read the short text below. Then discuss the questions that follow in groups. Scientists are often seen as a homogenous bunch of geeky men in white lab coats and protective glasses, hunched over some kind of bubbling test tube whilst muttering to themselves or frantically scribbling equations on a scrap of paper. Such stereotypes not only fail to represent the full diversity of activities that scientists (of both sexes!) engage in, but also serve to dissuade the young from contemplating a career in science. It’s time for this to change! Does this text reflect your own view of scientists? Do you agree that negative stereotypes of scientists may well put young people off entering the field? Do you know anyone who works in the field of science? What do they do? If we think someone is weird or boring because they’re only interested in computers / science / studying, we often call them geeky. The noun is a geek. Many people also say nerdy / a nerd to mean the same thing. A homogenous bunch of geeky men in white lab coats. My brother is a complete science geek. He’s a nice guy, but he looks a bit nerdy, if you ask me! He’s such a nerd! He’s got no social skills whatsoever. So in a minute you’re going to discuss the degree to which the text reflects your own view of scientists. is it accurate, do you think? Or do you see things differently? Also, do you agree that negative stereotypes – the bad way in which scientists are portrayed – might put young people off entering the field? Might make them not want to become scientists? And do you know anyone who works in the field, the area, of science? If so, what do they do? I put students in pairs with one group of three and let them talk. Whilst they talked, I monitored and listened in to discussions, chipped in with my own comments and thoughts on occasion, helped out if students were struggling to say things and – crucially, I’d argue – picked up on things that I understood, but which I knew I’d say slightly differently. At this level, there is an issue in looking for errors, because by definition Advanced students can basically say what they want to say without really making many mistakes at all. A better way to think about the teacher’s role during student speaking slots is to listen for things they could say better. By the end of six or seven minutes, I’d written a fair few gapped sentences up on the board and stopped the class by saying OK. Great. Now let’s look at how to say some of the things you were trying to say in better English. First, let’s just look at a few bits and pieces from the text itself. I asked where the stress was, and having elicited it, marked it with a circle and made a couple of students repeat the word. I then asked what the opposite was. One student said heterogeneous, which I said was fine, but sounded a bit too formal and academic and that in spoken English it was more common to say . . . ? I then wrote a d on the board and got diverse from someone. I then asked for examples of homogenous and diverse societies and was offered Japan and the UK, which worked fine. Someone then joked that the class itself was a very diverse group! With hunched over, I simply explained it to the whole class and showed the example. Someone said “Oh, it’s like Quasimodo”. There was then some discussion about whether or not everyone in the class was familiar with the story of the hunchback of Notre dame – they weren’t of course . . . and I said Yes, he’s a hunchback in the story. The average life …………………. of scientists is quite low. They work themselves to ……….. / into an early …………….. – or they just …………. out young. It’s a very pr………………. job. They work really un…………….. hours. I know some scientists and they (don’t) really ………………. to the stereotype. I find the whole idea of being a scientist quite o…….-p…………… . To elicit the missing words, I usually do a kind of paraphrasing. Here, I said, for example: Some of you were saying you don’t think being a scientist is a good job as lots of scientists die young. The average length of their lives is quite low, so they have a low average life? One students said expectation. I said this was close, but usually your parents have high expectations of you or if you get 7.5 in your IELTS test it exceeds your expectations. I then got expectancy and wrote that up. I then talked briefly about how the average life expectancy in Russia has DROPPED DRAMATICALLY since 1991. I then said that some students had been talking about how scientists work really really hard – so hard they die young, so they work themselves to? And they work themselves into an early? I managed to elicit death, but only got grave after an extra bit of glossing – the place where they put the body when you die is your? Grave. Right, so they work themselves into an early grave. I then added: Or else what happens is just that they quickly end up finished in their careers, because they have no ideas or energy left after working so hard to begin with. I asked what others careers might result in early burnout and got teaching and banking. I then said that part of the problem was that scientists were under a lot of stress, a lot of pressure, so the job was very? One student said pressureful, which provoked much laughter and a comment about how they were inventing their own language. Eventually, I got pressurised. I added that scientists often have to work all night or from early in the morning until late in the night – according to some of the students, anyway – and so they had to work very UN hours? The first guess was unstable, and I said usually people are a bit unstable – mentally unstable, which means they may get angry or upset very easily. The next offering was unexpected. I explain you can’t work unexpected hours. News can be unexpected, or someone’s actions, but not hours you work. Next came unclear. I said often motives for crimes are unclear or you can be unclear about what you should you are supposed to do. To push things along a bit, I said that the hours made it difficult to make friends or to have a normal social life – and finally got unsocial! We then moved on and I said sometimes you meet people and they are actually the same as the stereotype you might have had about them, so they MMMM the stereotype. Students shouted out suit, meet, fit, so I wrote a c on the board. After another few seconds, I gave up and wrote conform up. We then moved on to another speaking task that would lead directly into the listening. I told the class that in a few minutes they’d hear five different scientists talking about their jobs, but that first they should look at the ten jobs in the box and discuss what they think each job involves, what the point of each job is, and so on. Students then chatted for a few minutes, whilst I went round. Here’s the task anyway. You are going to hear five different kinds of scientists talking about their jobs. A Work in pairs. Discuss these questions. What do you know about each of the different kinds of scientist below? What’s the main point of each job? What do you think their working lives involve on a day-to-day basis? After a few minutes, I rounded up by eliciting brief summaries of what each job involved, and clarifying where there were problems or differences of opinion. There was no boardwork during this slot, but we did discuss what the difference between anthropologists and sociologists might be, and there was a fair few minutes of discussion about whether or not military scientists really existed, whether they could really be called scientists if they didn’t make the results of their research open and so on. Somehow, this ended up taking in the kind of research into how to break people down, the results of which had been used in Guantanamo – what kind of music to play how loud and for how long in order to make people crack,. how long exactly you could hold people under water before they approached death, etc . . . as well as the fact that part of the MacArthur Pact after World War II involved Japan handing over all of the military research it had conducted, including all the horrendous experiments carried out during the occupation of parts of China. I then told the class to listen to five scientists speaking and to decide in each case what their job and what each job involved. B Listen and match each speaker to one of the ten different kinds of scientist in the box. What does each job involve? I played the CD all the way through, put students in pairs and asked to compare what they got. I monitored to help me get a feel for how much they’d grasped, what was causing problems and so on and after a couple of minutes, I elicited the answers from the group as a whole, trying wherever possible to rephrase students’ ideas using the lexis that had actually been used in the audio. So, for example, for the first job, the astrologer, one student said something like People imagine they are always spending every night watching the stars, but really it’s not like that and I say Yes, OK, so the stereotype of astrologers is that they stay up all night glued to their telescopes, but the reality is far more mundane. This kind of re-lexicalization is important, I think, as it acknowledges that students have processed the basic meanings, but confronts them again with the actual linguistic wrapping that the meaning came encased in, thereby encouraging noticing. 1 studies the possible harm that drought could do. 2 sometimes makes recommendations about living environments. 3 says their line of work involves making policy recommendations. 4 finds their job immensely satisfying. 5 says their line of work is more boring than is commonly believed. 6 feels the stereotype about their job is out of date. 7 says work on family traits is a part of their field. 8 has done research on the global spread of a particular phenomenon. 9 notes a way in which their field is unusual. 10 is quite secretive about what their job involves. 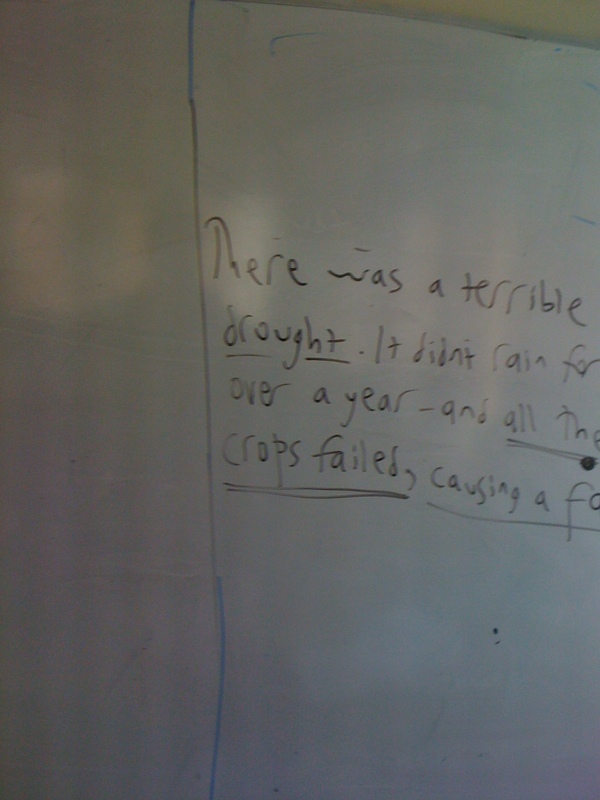 and simply wrote c…….. instead of crops and left the word famine out. Again, as I finished off, after we’d gone through Exercise Cm I elicited the missing words by saying that sometimes when there’s a drought, when it doesn’t rain for ages, the plants that you grow for food die, the MMM fail – which got me crops – and that this causes people to die because of a lack of food, so it leads to? Which got me famine. Once I’d played the five extracts through again, I out students in pairs again to compare and discuss their answers before eliciting the answers. With these kinds of exercises, I try to focus not only on simply what the answers are, but WHY the answers are the answers. Again, this often leads to a kind of paraphrasing of students’ ideas and re-use of lexis from the actual audio. So, for instance, I’d elicit the 1 was a hydrologist, and ask how students knew. They often just ay things like ‘because of drought!’ and I’d say Yeah, OK, He said he looks at potential damage to the environment in low-flow areas, so the potential environmental damage caused by drought. Before I forget, if you’re interested, you can hear the listenings below. D Work in pairs. Discuss these questions. Which of the five jobs do you think sounds most interesting? Why? Which do you think is likely to be best / worst paid? Why? Can you think of any jobs where the stereotype may well be more glamorous than the reality? In what way? Students chatted about this for a few minutes. The best answer for the last question was models – it may look glamorous on TV, but the reality is never getting to eat, standing around for hours on end and being leched at by slimy fashion people! 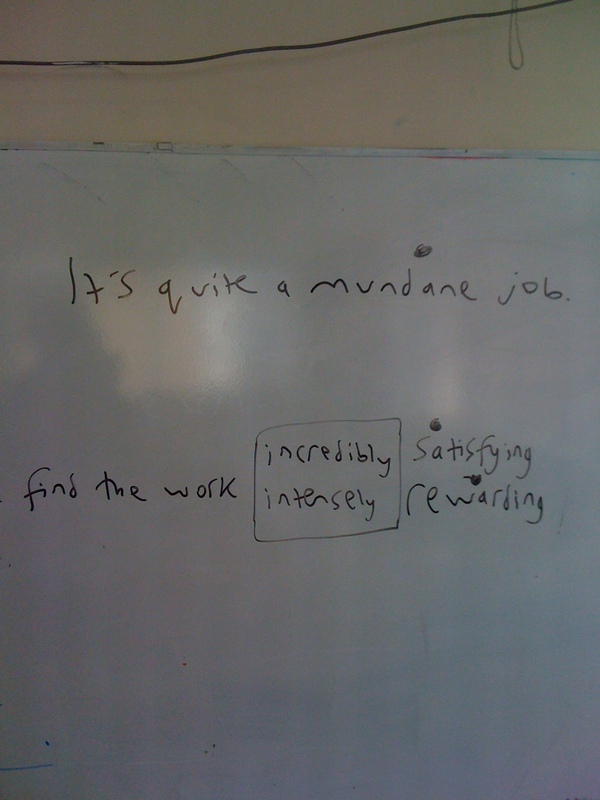 We finished with a tiny bit of boardwork – the words that I elicited were mundane and rewarding – first time each one! Hope this has proved interesting and not too much of a pain to read! Please feel free to add any comments, thoughts, questions, etc. I’m always really interested to hear what others may make of the way I teach. It’s a wet and windy Monday night – in June (!!) – and I’m sick to the back teeth of the ridiculous Jubilee nonsense that’s all over the TV, so now seems as good a time as any to pen my third eulogy in praise of the potential powers of non-native speaker teachers. 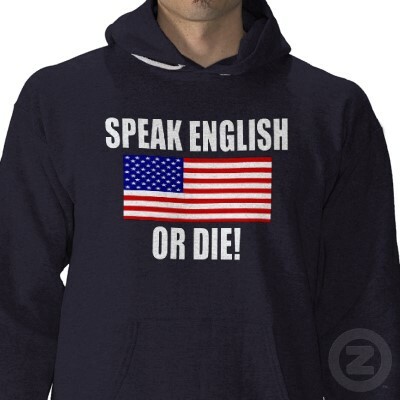 As with the two earlier posts in this little series, what I’m trying to do here to lay out ways in which non-natives working in monolingual situations, teaching students with whom they share an L1, can outshine native speakers, especially those who do NOT share the same first language as their students and / or who have only recently arrived in the country they are teaching in. I wrote in my last post about ways in which non-natives are perhaps best able to explain and get students to practise using new lexis by rooting it firmly in local contexts and today I’d like to suggest an extension of sorts of this idea: another way NNSTs can root the language more firmly in local contexts is through modeling. Now, modeling is often described and discussed as involving simply saying target sentences – especially grammatical ones – during PPP-based presentation stages, so that students can ‘copy’ the model and repeat, supposedly with better pronunciation that before. In this sense of the word, the non-native teacher is particularly disadvantaged – or at least made conscious of any insecurities they may have – as their sole role here is to model pronunciation of a structure – weak forms, elision, assimilation and all – and to then get students to repeat what they hear. Now, modeling is a good thing for a number of reasons: it helps to make clear to students what you want them to do; if well graded, it exposes them to useful lexis and grammar that may both help consolidate what they have learned already and that also suggests what may be useful for the turn they themselves will shortly be making; and it also shows that you as a teacher are also a human being. These reasons alone should be sufficient reason to consistently model speaking tasks for students, but in addition to all of this, what we choose to say when we model can offer a key way of rooting the language of the classroom in a local setting, thus making it more real for students. Let’s look at a classroom-based example here to clarify what I’m on about! A couple of terms back, I was using Cutting Edge Intermediate one day a week with a class I shared with two other teachers. 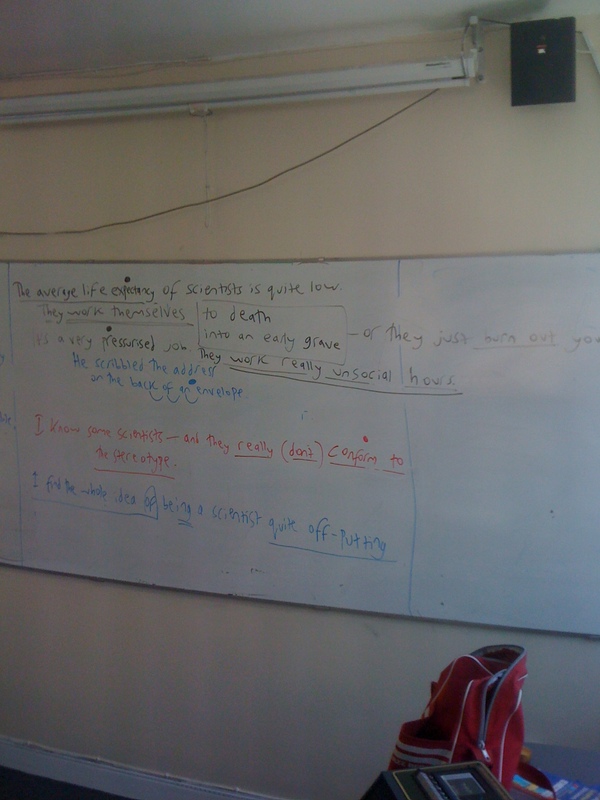 One lesson, we started a unit called Life Stories, which began with a list of vocabulary like leave home, start work, retire, move house, settle down, etc. that students had to sort chronologically. Once they’d done this, there was a short speaking exercise asking them to find four things which they’d done already or were doing at the moment; four which they’d like to do one day; four they would NOT like to do and four they could do at any time in their lives – and to then compare answers with a partner. Without modeling on the part of the teacher, these kind of ‘compare your answers’ tasks can often fall flat and result in students doing just that – comparing answers – and little more! Obviously, on one level, this could be seen as simply personalizing the coursebook, and admittedly, there’s a fine line between personalizing and localizing – and in some ways it’s not a distinction that’s really worth exploring as both acts help to make the book more real to the students. 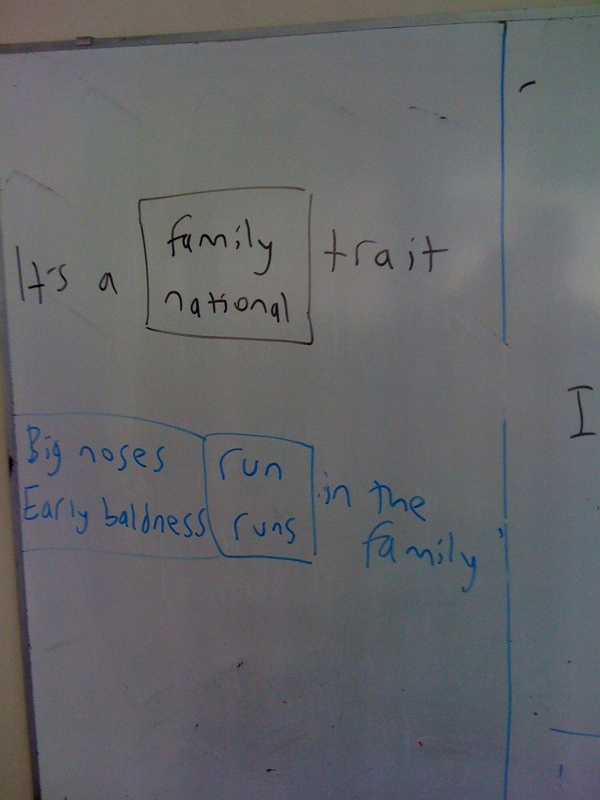 However, for our purposes today, the aspect of the above that interests me is the fact that the task roots the impersonal language of the book in a geography that is familiar to the students – and if this is true for me, with my multi-lingual students in the UK, then imagine how much more true it is for a NNST with mono-lingual students, most of whom will be studying in their hometown. These kinds of stories send subliminal messages: English is not just for talking about Britain and the British; it can also be a way for us to tell each other – and thus to tell the world – about OUR realities and our lives.